Just a small project for one of my other joys, clay. When working in clay I sometimes need ‘sheets’ of clay in same thickness. So I made this table top to solve the job. Materials: a piece of MDF, some old wood blinds and a piece of a parasol. 2. Some old wooden blinds. 3. Cut to fit MDF..
4. Piece of parasol rod cut to size. 5. Hole through the blinds and a counter sunk screw. 6. 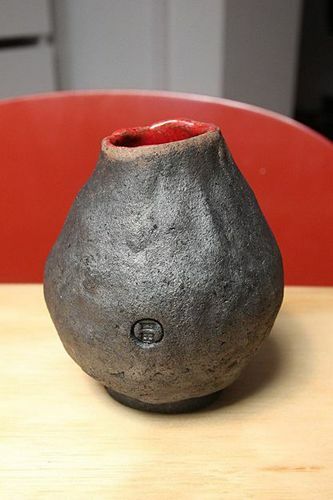 Raku fired vase by me, made from clay rolled to thickness. Good idea for a nice project my friend. That’s the way to do it Mads. Do you have a kiln? Looks great Mads! Nice to see you work in other mediums as well. You are a man of many talents. And a busy one too. Very ingenious to make uniform thickness sheets!!!!!!!!!!!!!!!!!!!!!!!!!!!!!!!!! Much nicer then my clay roller I just have a dowel and some scrap jucks of mdf LOL. Working with clay is so rewarding. No waste and no mistakes. So much fun to see what comes out of the kiln, especially when using glazes. Hi hi ho and a bottle of rum. Soda, big smile here, so happy to see you. 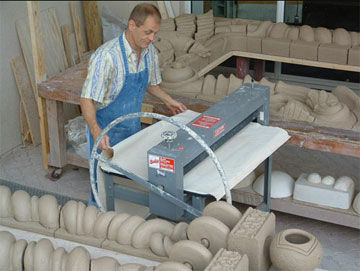 Ken, I have access to a kiln where I do my clay croquis, so I can burn what I need. ;-) Lucky I am. 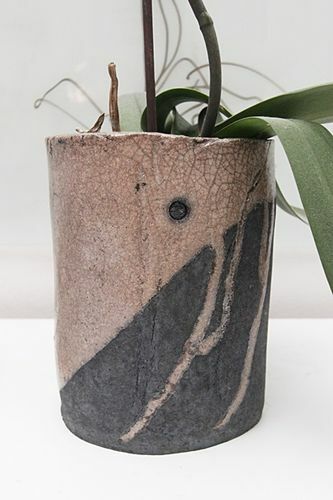 Deaon, thank you, the vase is raku burned, great fun and gives a feeling of nature to the final result that I like. Here another little vase done in that way. Steve, yes the days are too short, but as long as we enjoy them, it feels fine and we will one day leave happy. Lew, yes I also love that element of surprise. Biggest problem is what to do with all that stuff… lol. This is what the pro do.